Worzel Gummidge, a scarecrow that could come to life and lived in Ten Acre Field, was modelled on any number of men you’d find wandering aimlessly around Omagh, Killyclogher, Tattyreagh, Strabane or Dromore according to two producers who worked on the show during 1979 and 1981. 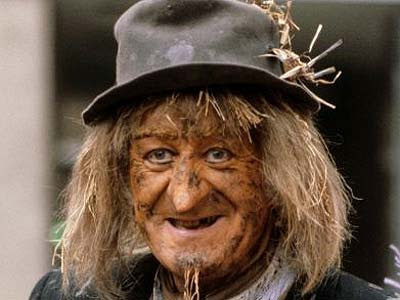 Gummidge, whose catchphrase was ‘A cup o’ tea an’ a slice o’ cake‘, was played by John Pertwee with his love interest coming from Aunt Sally acted by Una Stubbs. There are no plans to reboot Worzel Gummidge. Posted on February 3, 2015, in Ballinderry, Brocagh, Dromore, Killyclogher, Omagh, Strabane, Tattyreagh and tagged Ballinderry, Brocagh, Dromore, john pertwee, Killyclogher, Moortown, Omagh, Strabane, Tattyreagh, una stubbs, worzel gummidge, wrangler. Bookmark the permalink. Leave a comment.